The state of Maryland features three distinct growing environments for the abundant plant life that thrives in this mid-Atlantic state. The three sections include coastal plains, the Piedmont and the mountainous area of western Maryland. Evergreens grow abundantly across these regions as foliage plants that retain their leaves or needles throughout the year. Native evergreen plants of Maryland feature plants that have adapted to the varied environments of the state and include plants identified when European settlers first began to settle in this area of the United States. The mountain laurel can reach up to 25 feet in height in its natural home in the piedmont area of Maryland. These beautiful shrubs feature shiny green oblong leaves and beautiful white cup-shaped flowers. Mountain laurel flowers grow in clusters and feature purple marking in the interior of the flower. Flowers also appear in rose colored clusters on different cultivars. This shrub is hardy in USDA zones 5 to 9 and normally reaches a height of 10 feet in areas other than the Piedmont. Mountain laurel likes good drainage and thrives in a partial-shade to full-sun garden. American holly grows well in the mid-Atlantic region and serves as a staple shrub in many Maryland gardens. This native shrub can reach up to 50 feet in height so this plant needs plenty of room to grow in the home landscape. 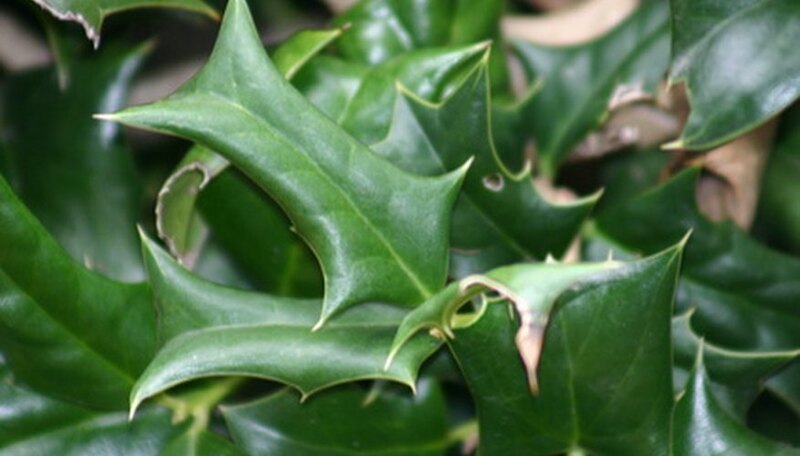 American holly won't disappoint with its glossy green leaves featuring the trademark pointy spines on the leaf edges. American holly produces berries in the fall and prefers a location out of direct wind. This Maryland native likes a full to partial sun location in the landscape as well as a moist planting site. This plant is hardy up to zone 5. Nurseries and florists often use American holly as a decorative accent for holiday planters, wreaths and ornaments. Maryland boasts a beautiful succulent plant that tolerates a wide range of soil conditions. Mountain stonecrop features thick rounded leaves that tolerate planting in coastal regions, woodlands and rocky slopes of the state. This plant produces white pinwheel type flowers in early summer and is a low-growing evergreen ground cover. Stonecrop's growth habit allows this plant to creep across the landscape to add interesting texture in garden areas. This plant prefers light to moderate shade and cool soil to flourish. Gardeners often use this evergreen in rock gardens to benefit from the spreading nature of this beautiful succulent.